Invitations is rated 4.9 out of 5 by 25. Design and print invitation cards with a variety of custom options. "PrintPlace has a great, usable website! We can easily upload our own artwork and we have found everyone to be very helpful and thorough in regards to the details." Rated 5 out of 5 by Sam43 from Fast and Easy As always the process was so easy. They were printed and delivered quickly and look beautiful! Rated 5 out of 5 by Caitlin93 from Beautiful Save the Dates! I ordered my wedding Save the Dates a month ago and absolutely love them! Great quality. I've received many compliments on how beautiful they are. I'm also very impressed with the envelopes that came with them. Overall, I am extremely happy with my order! Rated 5 out of 5 by cconely from Happy Customer I ordered invitations for my baby shower and they came out amazing. The size and color came out perfect. I love that you can preview your order before finalizing it. I will definitely use PrintPlace again. Rated 5 out of 5 by Denny Den from Wedding Invites Loved our invitations. Will be using Print Place again ! Rated 5 out of 5 by yourrisha from Great product for an exceptional price. I ordered these invitations for my wedding on July 22nd and received them well within 2 weeks. The quality was excellent and as described on the website. I will definitely use PrintPlace for my thank you cards, as well as for other printable projects in the future. Rated 5 out of 5 by KTH1 from Gender reveal invitations I was very impressed with the print quality of our invitations! I bought the file from an Etsy shop and then uploaded them here to be printed. Rated 5 out of 5 by suzy from Quality & fast Received my order a day before I expected it. Always quality products and correct colors. Rated 5 out of 5 by SarahK from The colors were perfect! I bought these invitations for my sons 3rd Hulk Smash Birthday and I can’t be more satisfied with them! The quality is better than any other invitations I’ve ordered from other places and the colors of the photos were great! Rated 5 out of 5 by Bridget Ann from Great Print Quality Very fast production and shipping! Excellent quality! Rated 5 out of 5 by Danielle from Perfect Save the Dates! Our Save the Dates turned out perfect! We love them and have received lots of compliments on how nice they turned out! And the price was right! Rated 5 out of 5 by melissa04 from Looks Great! The quality and color look great! Our invitations are exactly what we wanted! Rated 5 out of 5 by Happy Customer from Great place, convenient and professional services My print request was submitted online before midnight and I was able to pickup my order early as opposed to the initial turnaround time. They were efficient, professional and I received a quality product. I've recommended them to a friend. Rated 5 out of 5 by Happy Printer from Excellent Customer Service As a first time user, I needed to call in to see how to resize my images.. the rep was pleasant and knowledgeable; I didn't have to spend much time to get what I needed done taken care of-- and the PrintPlace team took care of everything including resizing my images to fit the postcards I ordered! They arrived in great timing and were perfect! Thank you PrintPlace!! Rated 5 out of 5 by lilmama76 from Great Quality!! I always get great quality at Print Place and I like that they are local. Rated 5 out of 5 by Albert from Looked Great! Turned out exactly how I expected. Came quickly. Great quality. Rated 5 out of 5 by Daffodill from Quick process Invitations look great. Great service. Quick shipment. Rated 4 out of 5 by April from Great Experience Overall The invitations I received were fantastic, and the service the company provides is wonderful. The only negative part was part of the print looked a little odd, but it was great overall! Rated 4 out of 5 by non profit director from Great Customer Service When my order arrived it had been printed on incorrect paper. I want sure whose fault it was, but I needed replacements made immediately. The customer service team reviewed things, decided that it was their error, and fixed it immediately. When they asked what was the latest date that I could receive the replacements, I said Friday. She replied, "Let's make it Thursday." I was impressed. Rated 4 out of 5 by k8t3 from Excellent Turn Out: Everything printed exactly how it was on my computer when I designed the invite. The only issue I had was the color not being consistent between all of my pieces even though I used the same color selection when designing. They still turned out great so I can't complain too much. Custom invitations let your personality and theme shine, since the design possibilities are endless. Our invitation cards give you a unique way to announce your next business event, political party, or baby shower. Print on one side only or both, and keep in mind that uncoated invitations are easiest for writing by hand. Our most popular invitation card sizes are 4” x 6” and 5” x 7” since they are designed to coordinate perfectly with our A6 and A7 envelopes. In a hurry? Invitation printing is available for same-day turnaround. Use our layout templates to ensure your invitation card artwork meets requirements for printing. Free layout templates are provided in PDF, EPS, JPG and Publisher for printing. We can make printing and mailing easy for you since we offer both in one place. Our invitation cards can be mailed with or without envelopes. A more formal invitation might call for envelopes that you can customize with your logo, return address, or a design that matches your invitation layout. We can insert your cards into envelopes, inkjet addresses, and mail them. You can also choose to mail your invitations without envelopes by formatting them like a postcard by leaving room for a mailing panel and indicia space on one side. Don’t just email your invitations. 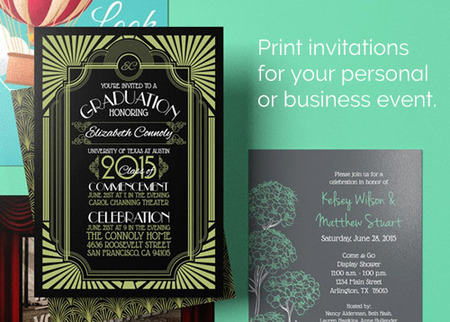 Increase response rates with printed invitations. Not sure where to start? A photograph is usually a good place to begin. It makes the card more personal and immediately draws attention to the reason for the invitation. Don’t forget to use the reverse side too. The back is a perfect place for a map or additional party details. Using two sides also allows you to space text appropriately for the cleanest design. Keep in mind the occasion and message you want to send. This will help determine what size is best. Printing on a larger invitation is typically used for a casual occasion like a staff party, while a smaller, thicker cover stock is usually best for a more formal dinner. Be creative. Add rounded corners for a sleek look, or a perforation for a ticket or response card. You are only limited by your imagination, so let us help you dream up something that your guests will talk about for years.